There was a sense of excitement as the trio opened their first set in Birmingham of a mostly north England tour. Adjectives such as spiritual, energized, even devotional all come to mind. The meeting with Ken Vandermark in a classic trio formation of Saxophone (doubling clarinet), bass and percussion was suggested by Mark Sanders reacting to a tour proposal by the indefatigable organizer of Jazz events in the U. K. Tony Dudley-Evans. The music was like an initiation, a very special meeting of three practitioners in the arcane art of improvisation. It was electric, with all channels of communication tuned to the maximum sensitivity. Later, sometime after the tour, the inevi- table had to be considered - the choice of music for these CDs and titles that might impart a sense of the occasion. The album title FOX FIRE refers to a Finnish fable about a fox starting fires by running across the snow with its sweeping tail sending sparks off into the sky – The Northern Lights or Aurora Borealis. The Finnish word for Fox Fire is Revontulet. There was certainly an awareness of fiery interactions within the trio music. Two titles, taken from the Hopi Indian language speak for themselves: KATSINA (initiation) the mainstay of Hopi culture where spiritual ties are established uniting the people whatever their geographical, linguistic or political persuasions. Boundaries are similarly transcended in improvisation, and communication between colleagues ensures the rites of passage. And KWINGYAW(the person who lives up in the cold North) which we dedicate to Tony Dudley-Evans. But what of disc two? Hop varieties grace these five tracks. On the stand the atmosphere was convivial and intense. Off the stand we had the chance to exchange philosophies, visit an exhibition of painter Francis Bacon (a favourite of Ken’s) in London and partake in the tasting of some very special English ales, which became something of a pungent disquisition into flavours, ingredients and geography.Well known are the various hops that impart a bitterness into a fermenting ale. Having explained the sources for the titles, I naturally hope that the listener will follow the unfolding process we went through as we traversed this musical landscape. This trio – Chicago saxophonist/­clarinettist Ken Vandermark with the British bass-and-drums partnership of Barry Guy and Mark Sanders – was ­assembled for a 2008 tour; the music here was caught on the road in Birmingham and Leeds. Unlike most of the jazz free-improvisers he often resembles (saxophonist Evan Parker in particular), Vandermark has a varied musical CV, having also worked in rock and R&B. Many of his records have made explicit jazz references (to anyone from Stan Getz to Sun Ra), but not this explosive double album, which goes to the outer reaches and stays there. Guy is a one-man ­orchestra of double-bass, percussion and electronic sounds, and Sanders splices the infectious swing of a straight­ahead jazz drummer to an inspirational rhythmic freedom. Some pieces are full of squealing top notes, pad-slaps and gruff Evan Parker-like multiphonics; others are warmer clarinet explorations. Guy's fast arco playing on Northern Lights ­creates an unnerving wind-noise effect behind the blurting tenor sax. It's an ­uncompromisingly in-the-moment ­album, but it bursts with life. The audience has been removed from these live concerts, recorded in 2008 in Birmingham and Leeds, featuring American reedman Ken Vandermark alongside British drummer Mark Sanders and bassist Barry Guy. Despite the constraints of a short, five-day UK tour of only six concerts, there's much to savor in the resulting two discs, for connoisseurs of creative music. Granted, there is no such thing as a "perfect" freely improvised recording. Listening to a recording is different from attending the recording event, studio or live—the result of mastering and engineering being further impacted by the playback system at hand, whether it's an iPod or $10,000 home audio system. All three musicians are adept at instant music making. Guy, the elder statesman, is a classically trained bassist who maintains a presence in both the improvised and compositional worlds. His partners have made their respective marks—Sanders, with the likes of Evan Parker, Jah Wobble, John Edwards and Paul Dunmall; Vandermark having built a reputation with his own Chicago groups Vandermark 5, Sound In Action Trio and the Frame Quartet. The reedman has also collaborated with European improvisers in countless ensembles. The proof here is the instantaneous manner in which the trio gets down to the business of music-making. This isn't just twiddling and tinkering with instruments; the three, in the classic sax/bass/drums configuration, narrate paths of sound governed by an unwritten set of rules. Sure, there are Herculean displays of power, such as the tortured passages of "Fuggle" and "Northern Lights," where the players seem to loosen their regard for understatement and ply the power. But overall, the presentation here is more for tension than noise. Sanders keeps an even-handed application of energy distribution, opting for speed over cacophony. 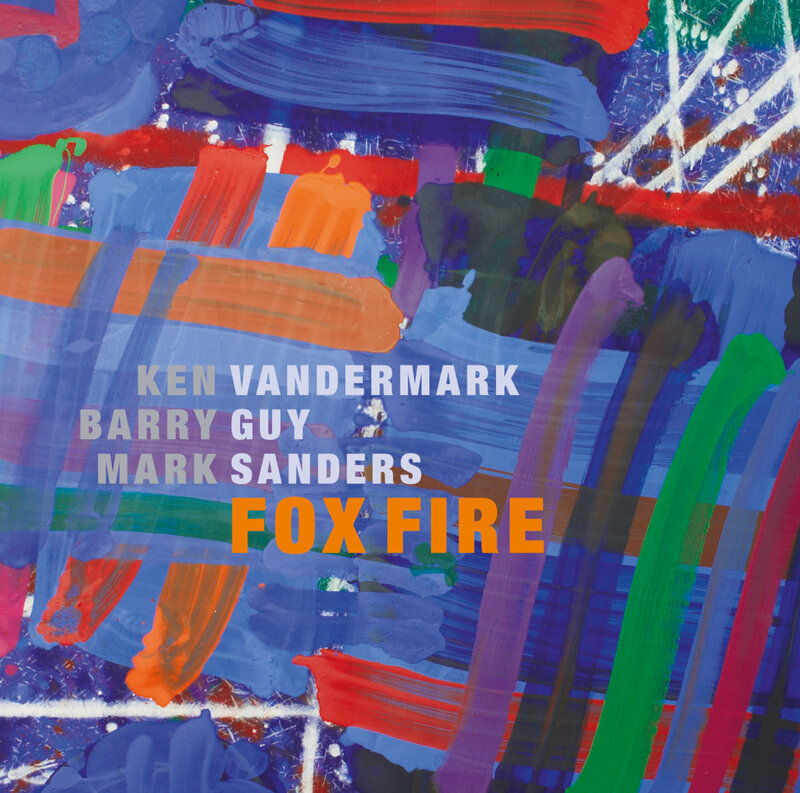 The true gems on Fox Fire are the quieter pieces that almost slip by, like "Revontulet," with the twinkling of Guy's notes against Vandermark's hesitant clarinet. With Sanders' shuffling brushes, the band builds a narrative with unhurried confidence. Paused for brief solos, it's an easy walk through the portal of imagination. Ken Vandermark is one of the great nomads of the jazz world, roaming the Earth in search of music to play and fellow travelers to collaborate with. This album is a double disc set recorded live in Birmingham and Leeds, UK with Vandermark on tenor saxophone and clarinet, Barry Guy on bass and Mark Sanders on drums. This album consists of two nice long sets of high energy free improvisation and the music is very exciting. The band is locked in tightly and listening to each each other with a great degree of empathy and understanding. Vandermark sounds very inspired by his British companions and blows with great gusto and masculine authority on the fast paced free pieces, while maintaining a bruised and vulnerable humility on the more abstract pieces. At times he really seems to be channeling the painter and physical artists that have influenced him into a painterly technique of broad strokes of music within a particular performance. Bassist Barry Guy is most well know for large ensemble works and compositions, but he thrives here as well, bowing and plucking his bass with great strength and dexterity. Sanders is a drummer that I wasn't familiar with prior to hearing this recording, but I was quite impressed with him as well. There is a fluidity to his playing that meshes perfectly with the other two musicians. Adding it all up, the results are very impressive. It is hard to pull out individual performances out for examination, because the music on both discs flows together as a whole with ebbs and flows like the tide. Fans of open ended free improvisation will find a lot to enjoy on this recording. The music is quite challenging (in the best way possible) and is bracing in its beauty and power.